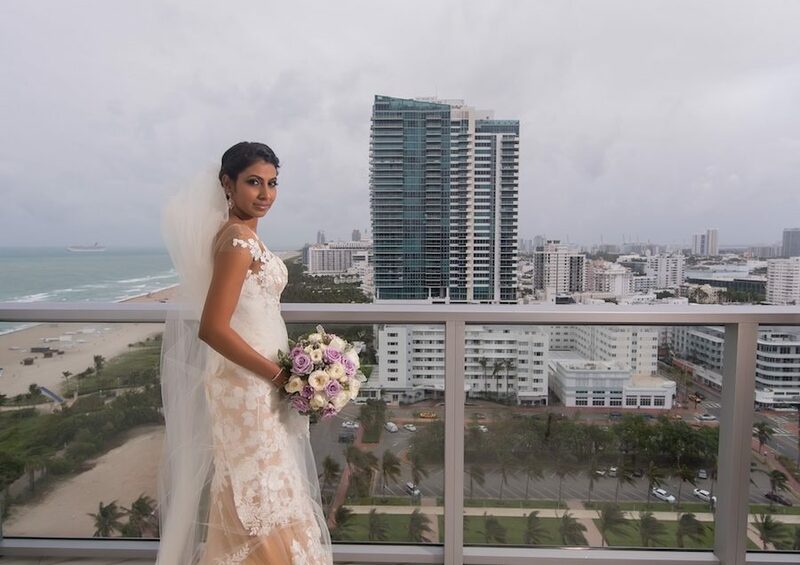 Caroline and Alex celebrated a modern classic wedding at the Hilton Bentley Miami this past October. Black-tie was both the dress code and the base of the affair’s theme. However, the stylish duo added charming personable elements which made the day all their own. There are few moments where Alex isn’t sporting an ear-to-ear smile or cracking up a loved one, and Caroline’s gaze is simply unforgettable. The moments leading up to Caroline’s walk down the aisle were tumultuous. 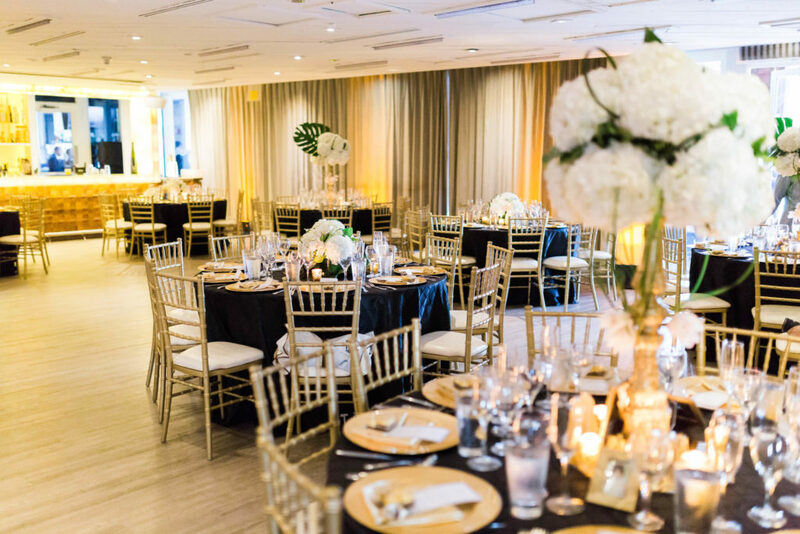 As hurricane season was upon us in Florida, the weather pushed Alex and Caroline’s celebration one entire day, to a new location in South Beach. 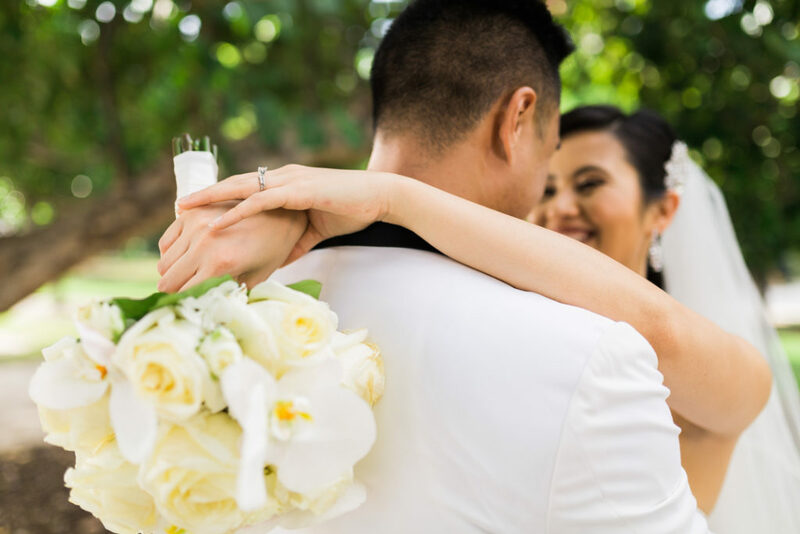 Luckily, all vendors were available and were able to make adjustments to ensure the couple saw their big day dreams come true. 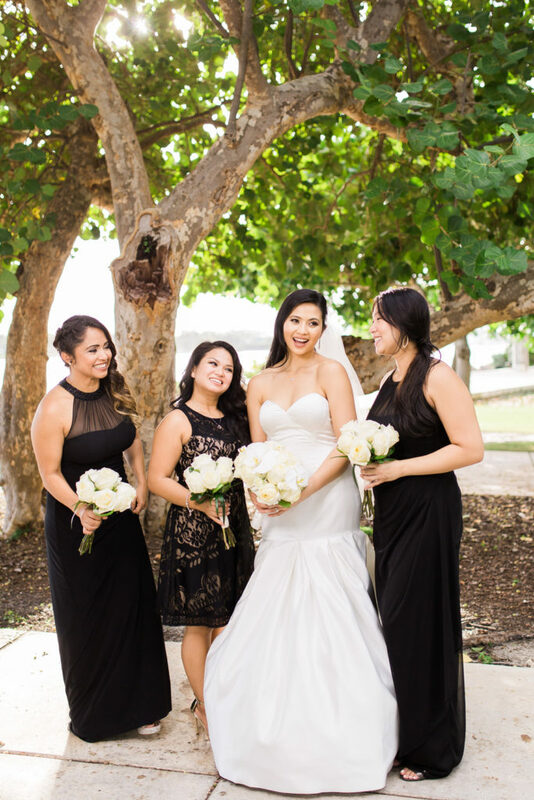 The stunning bride wore a modern classic wedding gown with a mermaid silhouette and traditional sweetheart neckline, which was modernized with trendy silk fabric and glamorous metallic accessories. 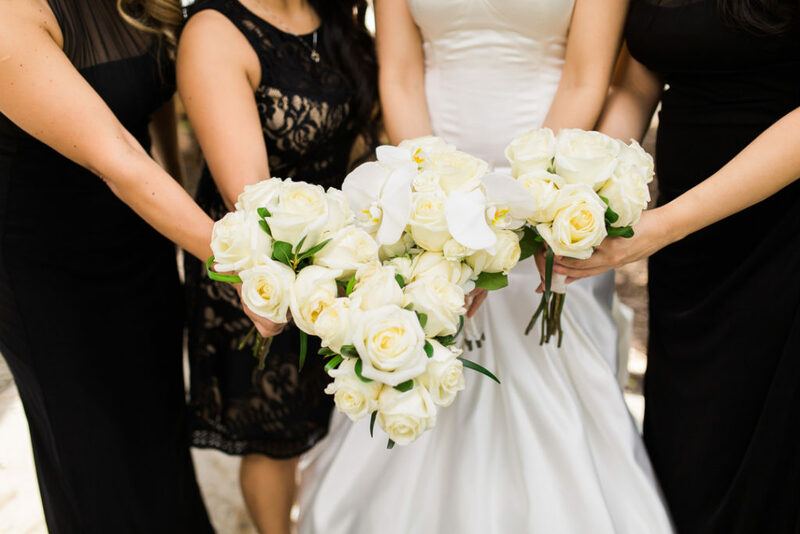 Her bouquet, comprised of fresh white roses, was the pièce de résistance in her bold Hollywood bridal look. Alex, on the other hand, wore a fashionable stark white tuxedo jacket, which he opted to balance with a timeless bowtie and boutonniere. 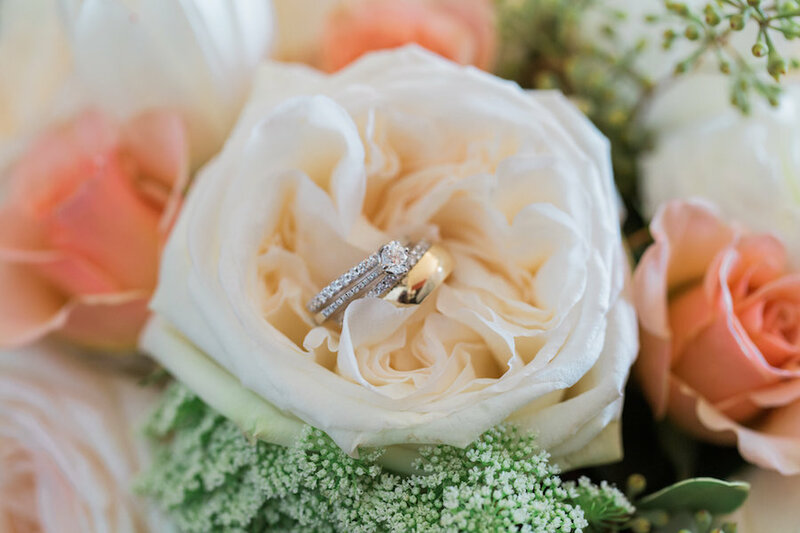 It was essential for the florals, from the arrangements to the bridal bouquet, to reflect the couple’s chic juxtaposition between classic and modern, while also showcasing touches of their lively personalities. 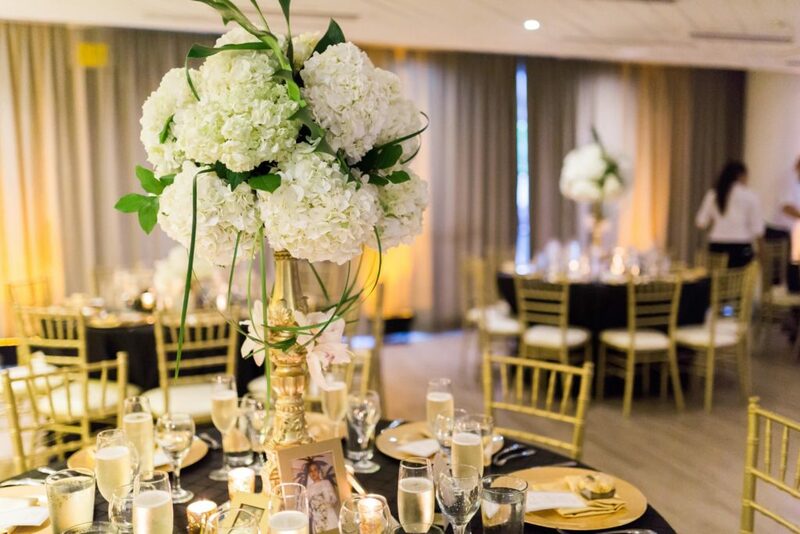 Subtle, linear greenery gave shape to bountiful hydrangeas, yet never distracted from the reception’s metropolitan glamour. 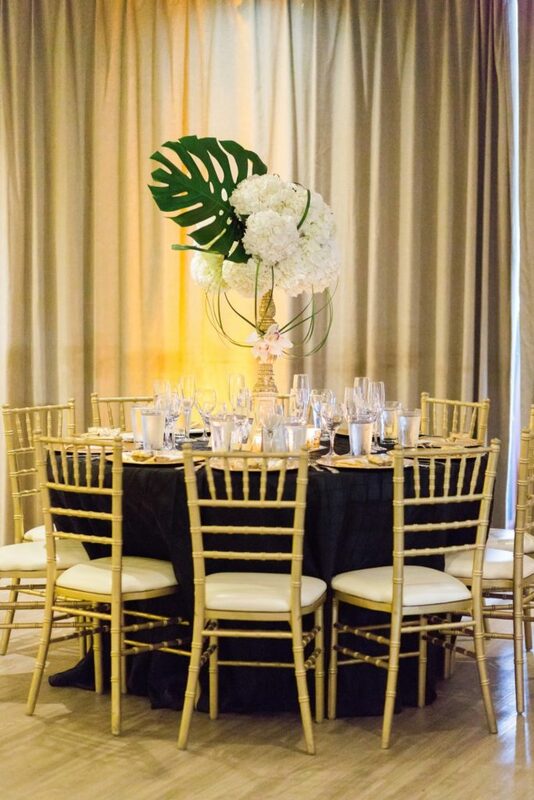 A single palm placed in the centerpieces gave the regal black and gold space an au courant update, while white roses romanticized a trendsetting spiraled cake. 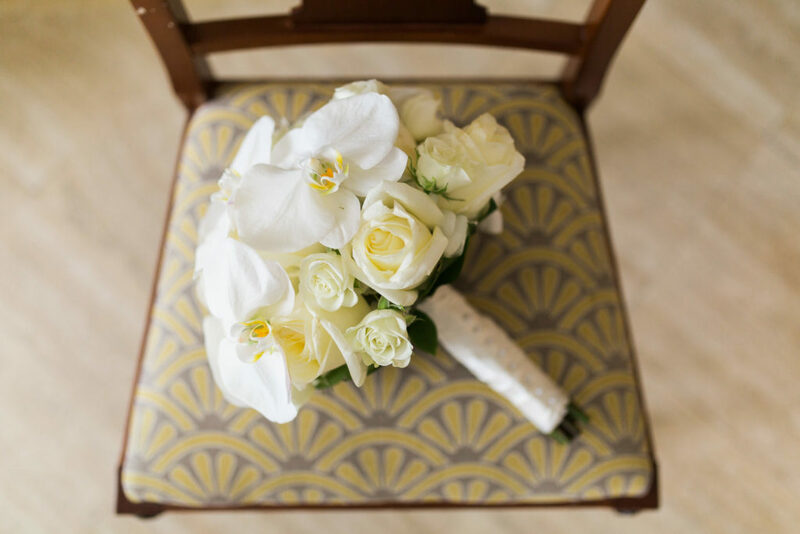 Though the floral palette was clean and complimentary, when set atop glossy black and warm tones, the white blooms shone. The newlyweds entered their reception laughing, with Caroline holding her bouquet high in the air victoriously. 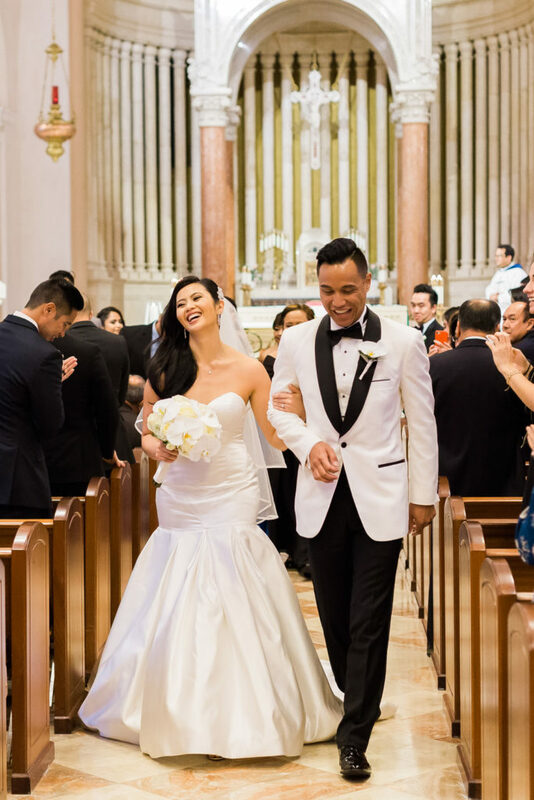 The couple animatedly welcomed the crowd before sharing a sweet and intimate first dance, where the laughter did not cease. In fact, it continued throughout the entire night; through memorable toasts from family members, the first bite of their wedding cake, and tossing Caroline’s bouquet. It was an honor to work with Caroline and Alex, who were sweet, attentive and excited throughout the entire process. 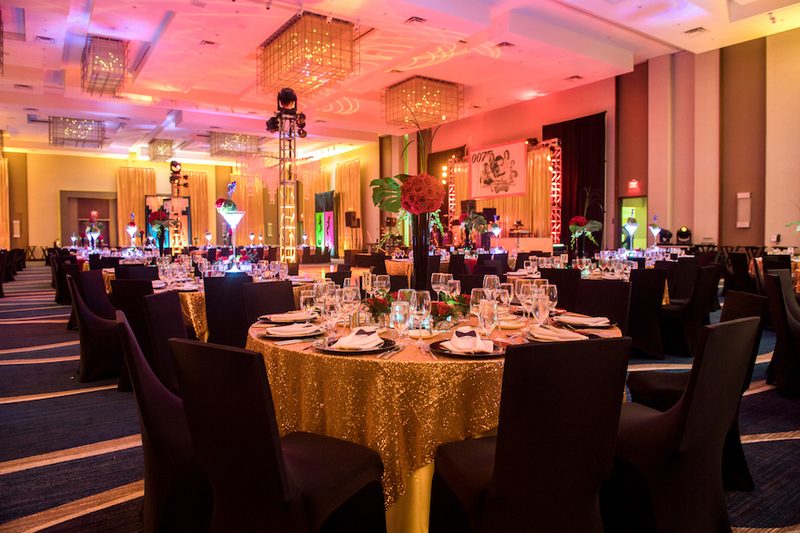 A special thank you to all the vendors who helped create this fantastic evening!